We hear it all the time, "I felt this pop in my knee." It may occur skiing, playing basketball, soccer, or even while at work. Rest assured that when you feel it, you will know something happened in your knee. The "pop" sensation is often followed by swelling, instability, and a trip to see me! 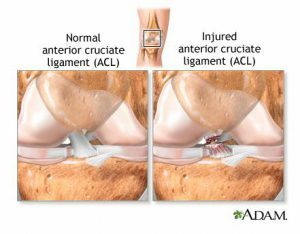 So what is the ACL (Anterior Cruciate Ligament)? The ACL is one of two ligaments that sit in the center of our knee in a crossing pattern. (The name "cruciate" comes from the Latin cruci or crux meaning cross.) The ACL is responsible for what is called anterior/posterior stability or you knee shifting forwards and backwards, as well as some rotational movements. Often individuals tear the ligament with a non-contact injury like twisting their knee, pivoting, or shifting with their leg planted. All of these movements cause the femur bone and tibia bone, where the ACL attaches, to shift and put stress on the ligament. If the stress becomes too great the ligament will give resulting in an ACL tear. Usually after the tear, one will experience a period of reduced range of motion, swelling, and instability. This is often when the patient is seen for their first in office appointment. X-ray studies are almost always negative in ACL tears. Physical exam findings will show swelling and positive testing for laxity or looseness in the knee. 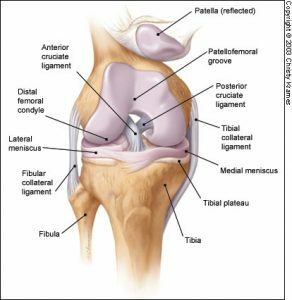 Often, pa tients are sent for MRI scans which will confirm the diagnosis of an ACL tear, and rule out other injury to the meniscus or ligaments. Patients will begin a short course of physical therapy to regain range of motion. It is always recommended that patients have a return of their range of motion and a reduction of their swelling before under going ACL reconstructive surgery. Motion before surgery always dictates motion after surgery, so it is much easier to rehab a knee if the motion was regained before surgery. At this point a lot of individuals are feeling significantly better, their swelling is down and motion is back; they are thinking--"Why am I having surgery?" Which is not a terrible question. So let me answer it. The ACL stabilizes the knee from shifting whether that be big noticeable shifts or small more micro-shifting. Each time the knee shifts there is potential for injury or tearing to the meniscus, and damage to the articular cartilage on the ends of the bones. The more times the knee shifts the more damage or at least risk for damage a patient accumulates. 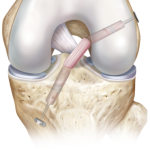 There are 3 types of autografts most surgeons choose from: patella tendon, hamstring, and quadriceps. All have pros and cons and in a good surgeon's hands would have fine choices for your graft. I will just give you a run down of each. Patella tendon, also know as a BTB graft has been around the longest and is considered the gold standard we compare everything else too. It takes a small portion of the patella tendon from the front of the knee and usually also a piece of bone from both the patella and the tibia "(shin bone) to form the graft. This is a strong graft similar to a native ACL however some patients especially those older than teens tend to get some knee cap pain from this graft. Hamstring tendon grafts have also been around a long time and take a small piece of the hamstring from the back of the thigh from it's attachment on the shin bone. This does not involve removing any bone, but does not act as much like a native ACL and some think it can stretch a bit. A quadriceps tendon graft removes a small portion of the central quadriceps tendon with or without a small piece of the patella bone. The quad graft is a newer graft and fewer surgeons are using it on a regular basis, it does have similar properties to a native ACL. Surgery involves removing the old torn ACL and drilling bone tunnels in the tibia and femur. These tunnels will allow for the graft to be pulled into the knee and secured with metal buttons or screws that come in a variety or materials. Rehab protocols will vary by surgeon, some will place patients in post operative braces and on crutches, some will begin physical therapy with in days or weeks. The most important thing to remember when it comes to rehabilitation is that it will take 9-12 months for the graft to mature and heal. That means a slow return to activities! I cannot stress that enough. I could do a whole separate blog on ACL rehab. If you take nothing else from this remember that everyone will heal at a different rate and it is important to listen to your body and doctor. Often a return to full athletic sport may take up to one year depending on the sport and athlete. ACL Rehab Why Does It Take So Long to Heal?